Hearts will undergo major change this summer as new players arrive, current ones depart and Tynecastle transforms into a modern football arena. The challenge for existing players is to survive the transition. Liam Smith is preparing to tough it out to ensure he is part of head coach Ian Cathro’s plans for next season. The 21-year-old full-back graduated from the Riccarton youth academy three years ago and is contracted until summer 2018. He knows the first-team squad will be reshaped once the final two Premiership games against St Johnstone tonight and Celtic on Sunday are over. Added to a new £12million main stand currently being erected on McLeod Street, the landscape in Gorgie will look decidedly different in just a few weeks’ time. “There are a lot of things changing, with the new stand and everything,” said Smith in an exclusive Evening News interview. “It’s also going to be the manager’s first pre-season, where he’ll get a prolonged period of time to bring in players he wants and implement the changes he wants. You’re right to say it’s more of a transitional period than it has been in the last two or three years. “You’ve just got to focus on yourself as a player. I’ve played the last few games and all I can do is try to show I’m capable of being part of the plans next season. “The league position means we can’t get into Europe any more but there are a lot of things to play for personally. Even boys who have contracts want to show they can be in the team next season and they don’t need replaced. People are playing for things right across the pitch so these final two games are anything but meaningless. Smith’s development has accelerated since he was thrown into a Europa League qualifying tie in Estonia last July. “I think I’ve come on massively,” he continued. “I had the high of playing in the Europa League qualifiers at the start, then a dip and then a loan period where I got to play in a different environment. I came back, then we had a new manager. It’s a lot of different experiences in one season that other people maybe don’t get. It can only be a positive for my development going forward. 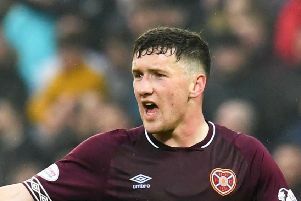 Hearts have provided their youngsters with plenty of role models in the hope that good habits will rub off. Smith is exactly the type of conscientious player eager to absorb information and learn from those who have played at the very top level in football. “Positionally, watching Callum Paterson’s progress has been great,” he explained. “He’s gone right through into the Scotland squad, which is brilliant. From a professional point of view, being around the likes of Don Cowie and Aaron Hughes on a day-to-day basis has been tremendous. You hear their stories from when they’ve played in England and it’s invaluable. You’ve got to soak up as much as you can from guys like that. “They talk about players you’ve watched on TV growing up but they’ve actually played with. It’s exciting to hear what they’ve got to say because you want to see if it matches your perception. They’ve seen these guys first-hand, then they tell you some of the stadiums they’ve played in, the games they’ve played in, the people they’ve come up against. It’s games you remember watching on the telly. There are signs Cathro is already planning for the new campaign. The recent switch to a three-man defence is something which could continue into the 2017/18 season and players are already adjusting to it. “I think it suits the players we’ve got,” said Smith. “I’ve played two roles in that system – I’ve been part of the three in central defence and I’ve played the wing-back role. I can adjust to that well. The wing-back position is good because you’re more involved in the build-up play. I even got myself into the box on Saturday at Ibrox, which doesn’t happen very often. I enjoy that position. Cathro us unlikely to deviate from that formation against St Johnstone or Celtic as he tries to engineer a strong finish to a difficult campaign. Then comes a summer of significance for the head coach, his squad and Hearts as a club. They will be a very different looking organisation come August.